One of the most striking monuments in St Pancras & Islington Cemetery – until repeated vandalism caused its removal some 20 years ago – was a top-hatted statue of Henry Croft, ‘The Original Pearly King’, based on the photograph above. 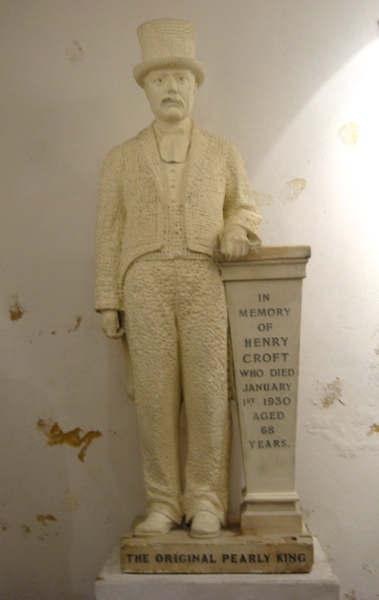 Henry Croft was born on 24 May 1861 in the St Pancras workhouse, in King’s Road (now St Pancras Way) in Somers Town, north London, where his mother – Elizabeth, the 27-year-old wife of a musician also called Henry – had been admitted that day. Mother and child were discharged a fortnight later, on 7 June, presumably returning to 10 Fitzroy Market (between present-day Warren Street and Grafton Way), the ‘Residence’ given in the workhouse records. On 24 February 1862 they were admitted again – their address now given as 18 Mary Place (off Stanhope Street) – being discharged on 13 March with a dole of two shillings (worth about £11 today). And they were back there again in 1863: from 31 January to 2 March – with Elizabeth’s occupation now given as ‘Charing’ (sic) rather than ‘Husband a musician’ and their residence as ‘None’ – and then from 14 March to 8 May, with residence again given as 18 Mary Place and no entry in the occupation column. In July 1864 Elizabeth again appears in the workhouse records, but this time without Henry, who by now had perhaps been sent to the St Pancras orphanage where he spent most of his childhood. It was in the orphanage that he learned the sewing skills which would prove so useful in creating the pearl-button-covered costumes that he later made famous; and it was the orphanage that in 1876 sent him to the roads and sewers department of St Pancras Borough Council to take up a job as a road sweeper, which was to be his occupation for all his working life. In 1883 at Burton Hall, Burton Crescent (now Cartwright Gardens), in St Pancras, a competition was held with a silver watch offered for the ‘flashest’ youth within a 12-mile radius. Young dudes came from every part of London, but the prize and the title of ‘Pearly King’ went to Henry. (It was a title already used by the music-hall performer Hyram Travers. 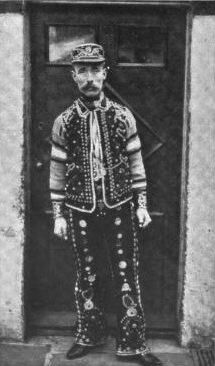 In February 1883 The Era reported that ‘Mr Hyram Travers, announced as the “pearly king,” appears almost covered with pearl buttons, and then modestly asks the spectators not to call him “flash.”’) Henry was probably wearing a ‘smother’ suit, with the fabric completely covered with pearl buttons, rather than one of the more restrained ‘skeleton’ suits which he also produced. He is believed to have eventually created seven suits for himself, as well as suits for others and various pearly accessories such as caps and belts. 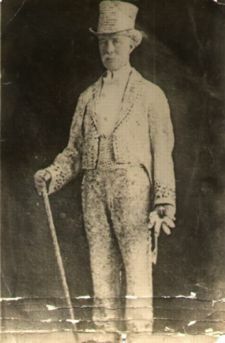 Henry – who was no more than 5 feet tall – used to wear his pearly outfits to stand out in charitable fetes and carnivals to collect money in aid of the children in the orphanage where he had been raised. He and his suit became a great attraction, and he was approached by hospitals, churches and other organisations to collect for the poor, deaf, dumb or blind. Eventually he had more requests for help than he could cope with single-handed. Tradition has it that Henry’s friends the costermongers had a custom of organising a whip-round for any of their number who had fallen on hard times, and Henry now asked them to help him with his charity work. They adopted the same style of costume, and so the pearly monarchy and its practice of raising money for charity began, eventually spreading to every London borough. The pearly king and queens became a very visible part of London life. The Pearly King of Somers Town, Leon Williams, was among the costermongers and their donkeys who took part in the International Horse Show at Olympia in 1907, and the Daily Express reported that at least half a dozen pearly kings took part there in 1912, though ‘the super-king was Mr. Henry Croft, of Euston-road, who wore a frock coat literally covered with “pearlies”.’ (The outfit that he wore at a costers’ donkey show at Crystal Palace in 1910 – not that he was ever a coster himself – was said to have had 20,300 buttons.) In 1924 The Times reported that a fund-raising carnival for St Dunstan’s institute for the blind was attended by the pearly kings of ‘Holloway, Hornsey, Poplar, Somers Town, Islington, and West London, and, in addition, Brother Croft, who has the title of “pearly king of the world”’ – a title also used below a Daily Mirror photograph of him taking part in a May Day demonstration in 1922. 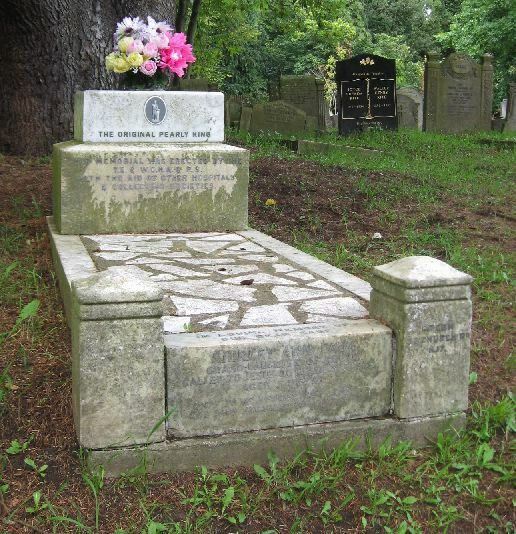 Though newspaper reports said that he had always been a teetotaller and non-smoker, Henry died of lung cancer on 1 January 1930, aged 68, in the St Pancras workhouse, where he had been born. Four hundred pearly kings and queens in their costumes attended his burial in St Pancras Cemetery on 7 January, his coffin being carried in a procession nearly half a mile long from his home in Charles Street (now Phoenix Road, by Euston station) in a hearse drawn by four black horses and with purple mort cloths. (Singer Ian Dury requested the same hearse for his funeral in April 2000.) Four pearly kings acted as pall bearers, and the coffin was topped with Henry’s famous pearl-covered tall hat and a black cushion bearing all the medals he had been awarded. One correspondent offered to sell me the wonderful costume of Croft, the first Pearly King, entirely covered – tall hat and all – with pearl buttons. Also I was offered a life-size stone statue of Croft wearing this marvellous costume. This statue was ordered some years ago from a Tottenham stone-mason, who had it sculptured in Italy, but could not collect the payment (£200). Both of them are most interesting, but difficult to pack in a suit-case! The statue was repeatedly vandalised in the mid-1990s and was eventually replaced by a marble slab bearing a photograph of what had been there. After restoration, in 2002 the statue itself was placed in the crypt of St Martin-in-the-Fields church, where the Original Pearly Kings and Queens Association holds annual pearly memorial and harvest festival services. I remember seeing the statue in the grave before it had to be removed. Good to know where it is now. The crowds that attended its unveiling are staggering; most people would have trekked up here by tram, I suppose.